After walking around the auto show all afternoon, we were ready to eat. We had decided to try Machu Picchu restaurant in downtown Cleveland. We'd enjoyed Peruvian food in Caracas at El Tizon, and missed it. We started with "Papa a la Huancaina" (thick slices of boiled potato topped with a Peruvian yellow cream sauce. 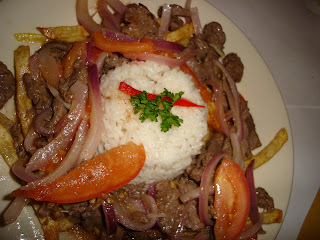 Served cold with a slice of egg and an olive) Then, we had this great dish called "Lomo Saltado". It's a big plate with a bed of french fries (the kind where you take fresh potatoes and cut them by hand and fry them) Then, on that bed of french fries there's stir fried beef, peppers, onions and tomatoes. And a big beautiful scoop of white rice in the middle. It's perfection! Anyone who chooses to eat fries and great rice at the same meal wins my love. The presentation itself was so pleasing I decided to actually use the camera in my phone. If I can figure out how to get the picture to my computer I'll post it here later. Oh, I almost forgot to mention the lovely little rolls they brought us! They were so good we ordered a dozen to bring home. Thanks Peru, for offering us such tasty treats! Update: I managed to get the picture sent from my phone to my email. The picture doesn't do it justice, sadly. It was much more colorful than this picture shows. In order to be fair, we'll go again soon - when we have birthday dinner for my daughter in a couple of weeks. Ahhh, Papa a la huancaina... delicious. I am from Peru, but now that i am in Japan, i would kill for a dish like that again. I hope you get to eat some Papa a la hauncaina soon. It's a most satisfying dish. Great comfort food, for certain. Perhaps you should open a Peruvian cafe?